The Australian Government's culture portal has some very good informationa nd sources relating to all aspects of Australian society and culture. The page on contact history is paricularly good. 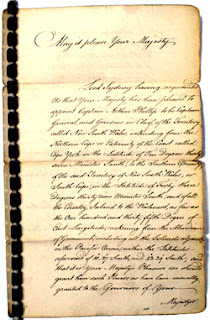 The Powerhouse Museum in Sydney had an exhibition called Objects Through Time... One of the exhibits was the document that Governor Phillip was given instructing him how to found the colony of New South Wales. 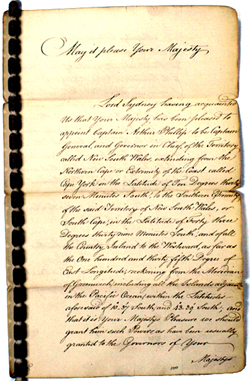 The Draught Instructions for Governor Phillip is the first official communication concerning the occupation and settlement of Australia. It empowers Captain Arthur Phillip to establish the first British Colony in Australia and to make grants of land and issue regulations for the Colony. They comprise a type of founding ‘Constitution’ for the new Colony.